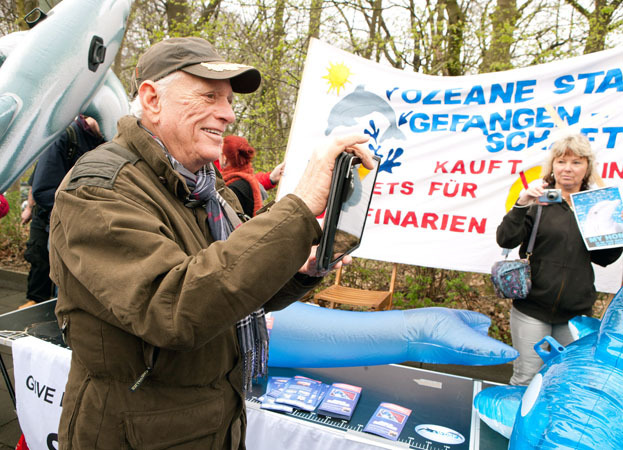 I am in Germany and Switzerland this week, working with local grassroots organizations dedicated to protecting dolphins to bring the issue of dolphin captivity to the attention of the public here in Europe. When I first came to Germany years ago to work on captivity, there were nine dolphinariums; today there are only two left. 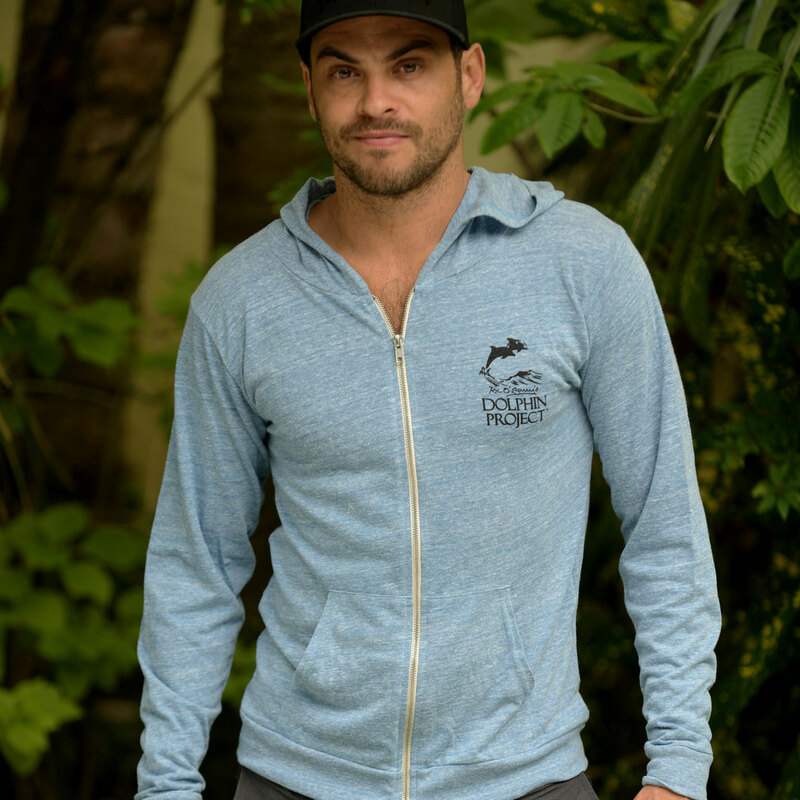 In Switzerland, only one dolphinarium still remains, and the Swiss Parliament recently passed legislation banning further imports of live dolphins for captive shows. We have made tremendous progress over the years, and this week has been marked by major demonstrations and packed press conferences. 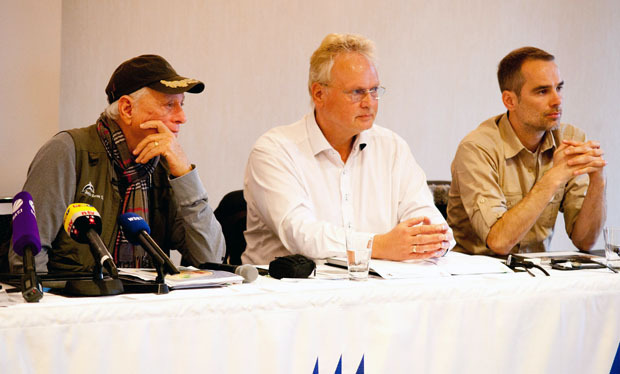 Ric O’Barry at the German Press conference against dolphins in captivity with Jürgen Ortmüller, CEO of the German Whale and Dolphin Protection Forum (WDSF), and Lars Gorschlueter of SAVE Wildlife Conservation Fund. Copyright by Timm Ortmüller Photography & WDSF (Whale & Dolphin Protection Forum). As part of the week, I even did an interview for a German children’s show. Needless to say, the kids who watch these shows are the future leaders of Germany and Switzerland. 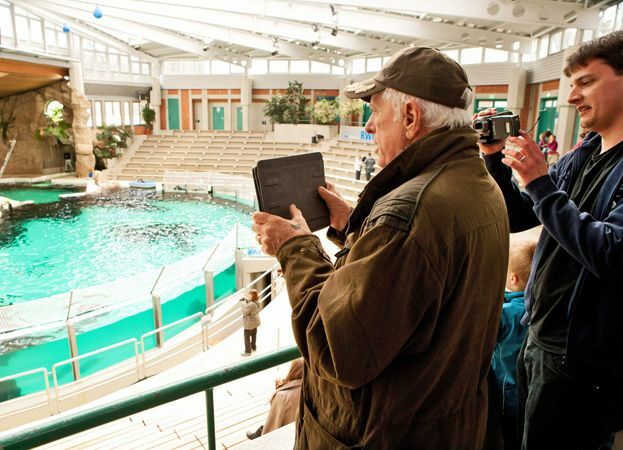 Ric and his trusty iPad broadcasting live from the demonstration against the Duisburg Zoo and from inside the dolphinarium in Germany. Copyright by Timm Ortmüller Photography & WDSF (Whale & Dolphin Protection Forum). 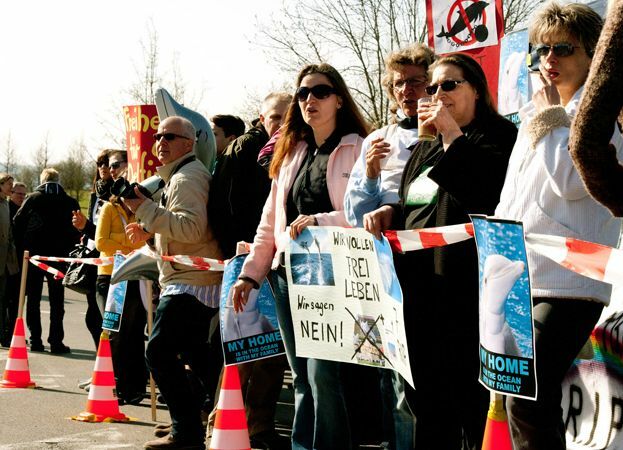 WDSF hosts a demonstration every week outside the Duisburg Zoo, which has a shockingly high mortality rate. From 1991 to 2011 alone, fifteen dolphins are known to have died there, according to the North Rhine-Westphalian Ministry for the Environment. 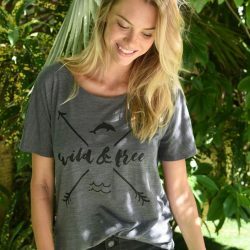 So far this year, WDSF volunteers have handed out 50,000 leaflets to zoo goers, asking them to not buy a ticket to the captive dolphin shows. 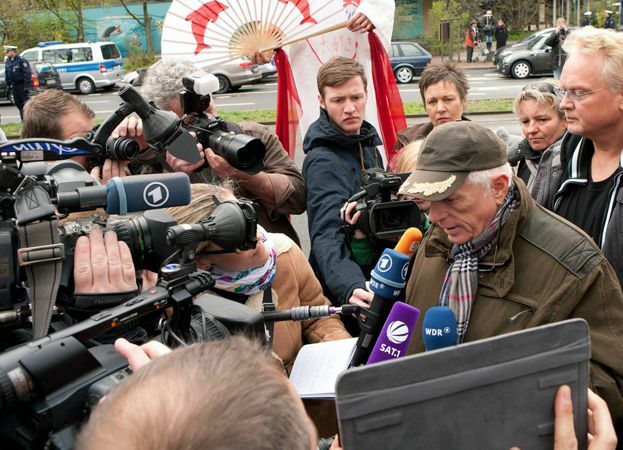 Ric at demonstration against the Duisburg Zoo in Germany, surrounded by the media. Copyright by Timm Ortmüller Photography & WDSF (Whale & Dolphin Protection Forum). Here’s my broadcast from our demonstration, using my iPad, with a turnout of 300 people from around Europe. We had quite a good time with the crowd and the public all around. The police were very friendly; we had a permit for the demonstration. I’m afraid the dolphin trainers at Duisburg Zoo were not so friendly, turning around with their backs to us in their improvised booth in front of the zoo extolling the keeping of dolphins in captivity. We then attempted to enter the zoo (yes, we had tickets), which you can watch on my Ustream Channel here. The following day, we went to Switzerland to demonstrate against the dolphinarium called Connyland, which lost two dolphins last fall when the park held a rave party (with loud techno music) around the dolphin tank. 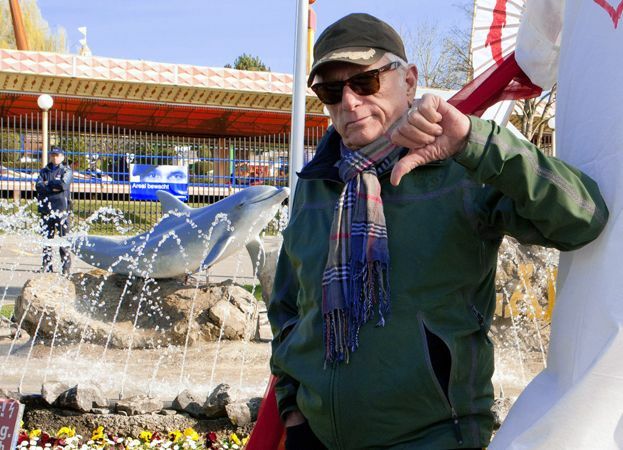 Connyland is the last dolphinarium in Switzerland and should close down now that the Swiss government has banned any further imports of live dolphins. 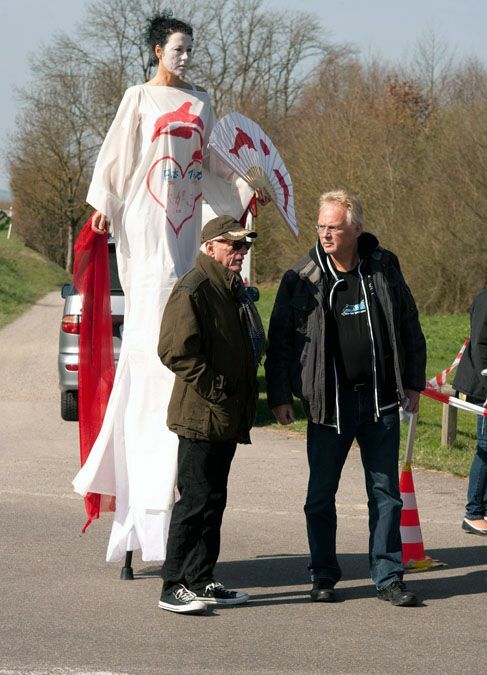 Ric and demonstrators at Connyland in Switzerland. Copyright by Timm Ortmüller Photography & WDSF (Whale- & Dolphin Protection- Forum). I want to thank two Swiss women activists, Angie Neuhaus and Gaby Bühler, for organizing our great demonstration at Connyland. More than 200 people turned out for the event. The stilt walker is Maria Heidemann, who has joined Ric in Taiji, Japan. Copyright by Timm Ortmüller Photography & WDSF (Whale- & Dolphin Protection- Forum). 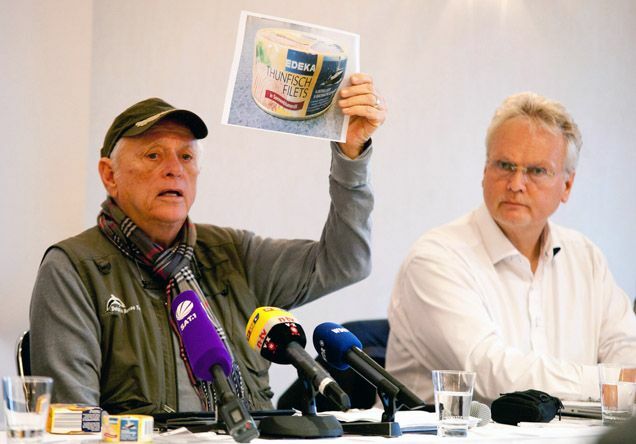 I raised an additional issue during our German press conference, and that was about EDEKA tuna, sold in Germany. Ric & Jürgen with EDEKA tuna photo. Copyright by Timm Ortmüller Photography & WDSF (Whale- & Dolphin Protection- Forum). 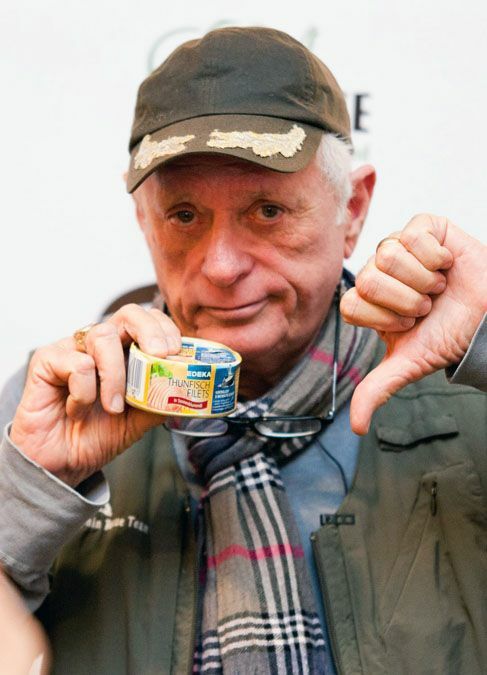 Ric gives thumbs-down to EDEKA tuna, which is dolphin-deadly tuna from Colombia caught by chasing, killing and maiming dolphins. 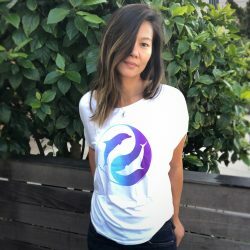 People in Germany should not buy it. Copyright by Timm Ortmüller Photography & WDSF (Whale & Dolphin Protection Forum). I hope you will pass the word to your friends in Germany: Don’t buy EDEKA tuna. 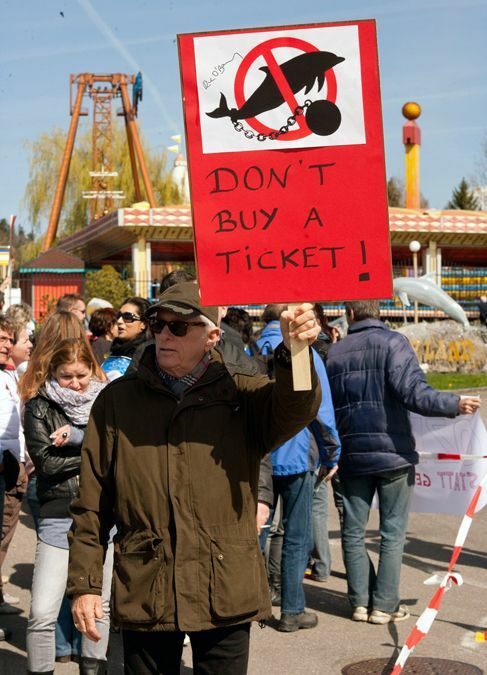 And don’t buy a ticket to a dolphin show or swim-with-captive-dolphins program! I’ll be doing further media interviews in Switzerland.